We analyzed over 4.3 billion LinkedIn ad impressions from January to June 2017 from AdStage customers. Based on our data, we saw CPMs increase from $7.29 to $8.39 during the first six months of 2017, while the average CPC increased from $6.03 to $6.50. Be sure to view the Q1 2018 Paid Search and Paid Social ads Benchmark Report for the latest trends. According to AdStage data, LinkedIn ad impressions dropped by 5%, while ad spend increased by 10% in Q2’17. This is causing advertisers to pay more to enter the auction at a decreased number of impressions. From our AdStage data, we saw CPMs decrease by 20% in Q1’17, and then dramatically increase by 44% in Q2’17. The overall CPM increased 15% since January 2017. This shows the competitive nature of the LinkedIn auction and may indicate that LinkedIn is reaching max ad load. Our internal findings also showed that LinkedIn CPCs went from $6.03 to $6.50 in the first six months. Q1’17 actually saw a 4% CPC decline while Q2’17 increased by 15%. While it’s a small increase, it may be enough to scare away smaller advertisers when thinking about the type of companies finding success on the network. LinkedIn advertisers are getting very consistent CTRs month-over-month. However, it’s costing more to get the same result due to higher CPMs and CPCs. Our AdStage ad spend data includes all Sponsored Content and text ads ran across LinkedIn’s network. Below are a couple of possible explanations for the increase in CPMs and CPCs in 2017. LinkedIn boasts more than 500 million users, which is impressive but still limited compared to Facebook. With a limited supply of ads coupled with growing demand, the auction is getting more competitive, which means advertisers will pay more to enter. LinkedIn’s user growth remains steady, but only 23% of members use the platform on a monthly basis. Ad placements cater to desktop users. Linkedin will need to find new ways to place more ads on their mobile app. More advertisers are using the ad platform. AJ says that engaging ad creative and offers are key to winning the auction. As more and more advertisers enter the competitive auction, the onus moves to advertisers to create ads that generate higher engagement rates. Advertisers who insist on pushing friction-prone offers like demos, trials, and sales conversations will not generate high enough Relevancy Scores to show, and when they do show, the cost per click will be so astronomical as to price these advertisers out of the auction. It's worth noting that LinkedIn recently announced their native Audience Network. This will allow advertisers to reach more people with Sponsored Content through third-party publishers placements. However, don’t expect a huge lift as beta advertisers only saw a 3-13% increase in unique impressions. Hanapin Marketing conducted a paid social survey asking marketers where they plan to increase and decrease budgets in 2017. 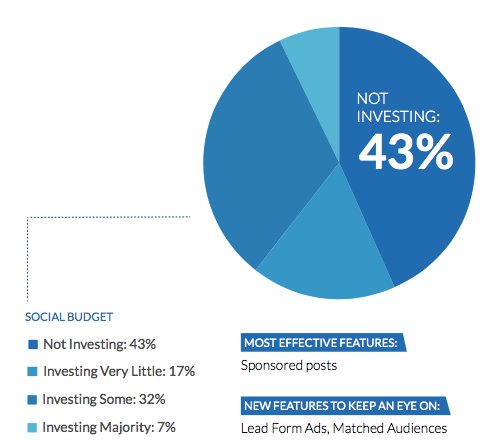 They found that 43% of marketers were NOT investing in LinkedIn Ads. However, 39% advertisers planned on increasing their ad spend within the following year. It looks like LinkedIn Ads are delivering results for certain companies, which is leading to budget increases. Our AdStage data confirms that LinkedIn advertisers are indeed increasing their budgets, as overall spend increased 23% since January 2017. LinkedIn released two big features that definitely got advertisers excited. It’s possible that advertisers increased their test budgets, leading to more competition in the auction. "We're currently also seeing much more interest building over time of new advertisers flocking to test out the platform, due to the continued addition of features as LinkedIn is quickly catching up to the pack." Lead Gen Forms -- This ad format helps marketers drive leads from Sponsored Content campaigns, particularly on mobile devices where conversion rates tend to be lower, as users don’t want to fill out a long form on-the-go. For B2B advertisers, the quality of the leads on LinkedIn is already far superior to other ad networks that offer lead gen ads. And, just like any other LinkedIn campaign, these campaigns come with the same reporting capabilities that LinkedIn already offers, so you can easily measure return on ad spend, cost per lead, and conversion rate. Matched Audiences -- LinkedIn announced a powerful new feature called Matched Audiences, which includes three new targeting tools that let you combine LinkedIn’s professional data with your own first-party data. Now you can target website visitors, contacts, and specific accounts on LinkedIn. By using natively uploaded videos as new ad inventory, LinkedIn could increase its overall ad load without cluttering user feeds or profile pages. Advertisers who win in the future with low costs per lead will do so by exercising a keen understanding of their customers' pains and needs, and providing useful content that solves them, without being overly salesy or pushy. Our mission at AdStage is to connect paid marketers quickly and easily to the data they need to understand holistic campaign performance and take action at scale. If you want to learn more about our LinkedIn Ads management solution, and click the banner below to download the latest Q1 2018 paid marketing benchmark report.